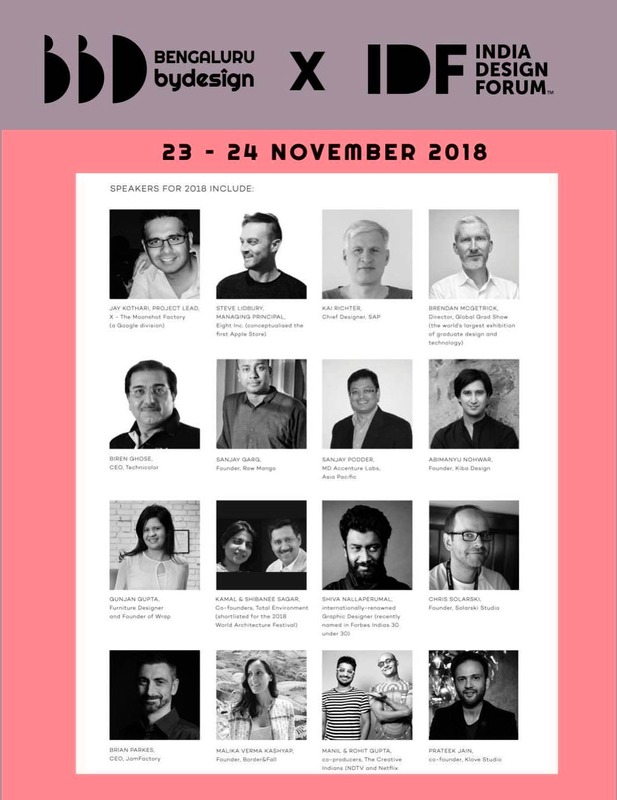 Bengaluru ByDesign presents IDF 2018 during the 10-day design festival held between November 23, 2018, and December 2, 2018. IDF 2018, the largest design conference in the country is one of the key highlights of the festival which will be held on November 23 and November 24 at UB City Amphitheatre, Bengaluru. The festival aims to engage diverse audiences via a series of design interventions. The collaboration with IDF 2018 aims to provide a platform for industry experts, professionals, and emerging design talent to interact and debate with their counterparts from around the world to create awareness on the power of design in India. This year's edition of IDF themed 'Disruptive Design', will discuss how cutting-edge innovation and technology is creating lifestyle changes universally. From what we wear to the way we consume information, and how we engage with our environment; how we live is changing rapidly with disruptive businesses and products. IDF will bring global thought leaders and practitioners of technology, innovation, and design to Bengaluru for the first time. The conference itself will embody this theme of disruption, taking place at the UB City Amphitheatre, an open-air location in the heart of the city, chosen to broaden the conversation around innovation and design. As with past editions, IDF Bengaluru will bring together leading designers and design-led organisations from across India and around the world, to discuss the innovations, trends, and technologies that are most relevant today. Previous years have looked at Empowering through Design (as part of Make in India); Design Matters; and The Power of Design. Renowned Indian and international design practitioners and thought-leaders will speak about the most exciting and impactful developments in design today. Some of the key international speakers include Brendan McGetrick (Curator, Global Grad Show, UK), Brian Parkes (CEO, JamFactory, Australia), Chris Solarski (Artist/Game Designer, Switzerland), Christian Girard (Co-Founder, Digital Knowledge, France), Kai Richter (Chief Designer, SAP, Germany), Karolina Merska (Artist/Designer, UK), Philippe Morel (Co-Founder, Digital Knowledge, France), and Steve Lidbury (Managing Principal, Eight Inc. London) amongst others. Speakers participating from India include Abimanyu Nohwar (Founder, Kiba Design), Biren Ghose (CEO, Technicolour), Francois Gramoli (Creative Director, WeWork), Gunjan Gupta (Furniture Designer and Founder of Wrap), Kamal & Shibanee Sagar (Co-Founders, Total Environment Building Systems), Karthik Vaidyanathan (Founder, Varnam Craft Collective), Malika Verma Kashyap (Founder, Border & Fall), Prateek Jain (Co-Founder, Klove Studio), Revati Kant, (Chief Design Officer, Titan Company Limited), Sanjay Garg (Founder, Raw Mango), Sanjay Podder (Managing Director, Accenture Labs), and Shiva Nallaperumal (Graphic Designer) amongst others. For more information, check out the official website of Bengaluru ByDesign.